Floating production, storage and offloading vessels (FPSOs) are in the ascendancy. The total FPSO market is now expected to grow to over $117 billion by 2024. A combination of factors, such as the recovered oil price and renewed interest in deeper, more marginal new reserves, have made these vessels the understandable choice for an industry that still remembers the travails of 2014. But nothing can be taken for granted. With an uptick in activity, operators need to be wary of supply-chain risks. Valves are a critical component of any new project and they must adhere to strict standards. With so many variables, including size and pressure ratings, the wrong product or materials in the wrong applications could prove disastrous. It is a costly mistake but it could have major health and safety implications. So, what are the risk considerations for FPSOs and how can operators ensure effective risk management on such a vast scale? In the distant days of 2010, a dozen FPSO contracts were awarded globally. However, when the oil price dropped, contract awards became deferred. 2014 saw 10, before dropping to five in 2015 and in 2016 no new awards were made at all. 2017 saw the recovery kick-in, with nine, and 2018 is set to continue the trend. Now, the renaissance is underway, and there are two interrelated reasons why. First, is that the oil price has recovered. At the time of writing, Brent is trading around the healthy $75/bbl point. Even before the recovery fully materialized, this was thought to be something of a sweet spot for FPSOs, which can often boast lower capex and opex costs than fixed alternatives in deep waters. At the same time, the industry has done what it does best over the last few years and innovated in the face of adversity. Singapore in particular has pushed hard to develop FPSO shipbuilding expertise, and places such as China, Thailand and Vietnam have also invested heavily in module fabrication and integration. Cumulatively, the engineering hard miles put in by the industry during the downturn have paid dividends, and it’s now feasible that some FPSO projects could be profitable at prices as low as $30/bbl – certainly at $50/bbl. So, there are reasons to be optimistic for the FPSO sector, but that’s not to overlook the risks. To build or outfit an FPSO is a serious engineering undertaking. There are thousands of engineering decisions to be made and procurement specifications to be written from the perspectives of many different specialisms. Valves are just one aspect, but with dozens of different basic designs, different materials and paint specifications available, with various applications, sizes and pressure ratings, it’s an easy one to get – if not quite wrong – suboptimal. The problem is that it’s simply not possible for contractors – operating on tight margins themselves – to maintain deep expertise in every possible niche. As such, procurement specifications are often written based on what has worked before or rule-of-thumb best practice. There are two major risks to this approach. On the one hand, procurement may play it safe and over-specify. For example, many specifications will place a blanket exclusion on valves or materials from certain countries or regions. This is an effective method for screening some of the less reliable factories in those regions but throws out the wheat along with the chaff. The fact is there are a number of state-of-the-art, highly reliable facilities in such regions but, lacking the means to distinguish between them, procurement teams over-specify to guarantee quality. This is understandable but presents a business risk to operators by potentially barring them from the best product at the best price. However, under-specification is arguably the greater risk. By failing to procure the best valves for the job, operators jeopardize anything from early replacement to valve failure. Both introduce significant costs: it is far more expensive to install new valves in the field than during initial fabrication, downtime eats into revenue and each valve will have been paid for twice. The biggest danger though, is that valve failure could mean loss of containment, creating major environmental and safety hazards – things no FPSO operator can afford. As the FPSO market swells and more contracts are awarded, managing these risks – across the whole supply chain and not just valves – will become increasingly important. The most effective way to manage the supply-chain risk that comes with growth in the FPSO market, is to pay close attention to the supplier list. On the one hand, the easiest thing to do is to simply disseminate a tender and opt for the supplier who promises to meet it for the best price. However, it’s worth paying attention to who that supplier is. The best suppliers will be able to complement the expertise of the procurement team with deep and broad experience in their own niche part of the puzzle. By playing a more consultative, rather than transactive, role, the supplier can help mitigate the risks described above. For instance, if the specifications stipulate no materials from a certain country, but the expert supplier can confidently recommend otherwise based on experience from similar projects, that can be a major cost saving. Similarly, suggested adjustments to the types of or finishes on valves based on prior work could yield savings or improve performance. It’s also important to consider timelines and delivery schedules when selecting a supplier as a partner in order to avoid costly overruns. By combining in-house manufacturing with access to supply from the wider market, a supplier can ensure the right combination of bespoke engineering expertise and fast delivery. In some cases, it is even possible to retain castings from specially designed valves for faster fulfilment of future needs too. Simply put: contractors should be looking for not just suppliers, but partners. By doing so they not only build a more robust supply chain but build out expertise that complements their own. As the FPSO market goes strength to strength and pressure grows to outfit vessels and get them in-field, minimizing risk will require just such an intelligent approach to the supply chain. James Moir is Group Sales Director at PJ Valves. Monthly reports -- Our monthly reports provide a detailed snapshot of the business sector as of the middle of each month. More than 80 pages of data and industry analysis each month. Excel spreadsheets with each report enable subscribers to tailor the data presentation to their needs. 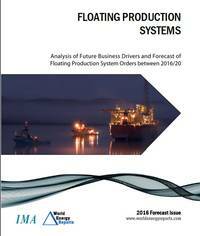 In October of each year we provide a detailed five year forecast of production floater orders. In March of each year we fine tune the forecast and make revisions as needed. Online database -- The online database is updated every day – with information direct from primary sources. In the database are details for 240 planned projects, 370 installations in service, 70+ floaters on order and 20+ floaters available. The database is fully searchable. Customized charts and spreadsheets can be directly produced from the database.